It’s not Just the Tree that’s Decorated! Now your first thought probably was “what does that mean?? ?” But you’d have to see for your self to believe it! We woke up this morning… and came down stairs… And one of my cats Hopper had red and green marker all over him!!!! It is so cute but it is messy. Right now I have some of his Christmas green marker stained on my hand! We will have t give him a bath later, but right now, we are enjoying his Christmas decor! I’ll try my best to post a picture soon. My cats have recently been having lots of fun with cat nip. Cat nip is a plant that is safe for cats to play with, smell, and even eat or lick a little bit. I sprinkled some cat nip out for my cats and they went crazy! They loved it. Tabitha and Annie both were covered in small, green pieces of the cat-safe plant by the time they were done! Vespa enjoyed it, too. She rolled around and played with the cat nip for awhile, untill she got annoyed when Annie and Tabitha joined in. So we put some more cat nip in a separate place for just Vespa to play with. Pearl did not have much interest in the cat nip. Some cats like it more than others. Hopper came down, and he liked the cat nip and rolled around in it for a while. But I think that Vespa enjoyed the cat nip most! Hi! Sorry I haven’t been writing a lot lately! We have been super busy with Thanks Giving! My cats and I have had a wonderful Thanks Giving! I am so thankful to have my cats! We TOTALLY forgot to give the cats turkey. We were planning to give them all turkey flavored canned cat food. But instead they had a canned cat food entitled “Ocean Fish Dinner”. Though that wasn’t “traditional” for them to have sea food for Thanks Giving dinner, but it was probably more tasty. You know how much cats love fish. Earlier today, I was walking to my cousin AC’s house and noticed Raymond, the adorable, orange, neighborhood Tabby Cat! His bright, orange, coat had just a hint of stripes. I stopped to pet him, and he began to purr and roll in the grass! He followed us all the way to AC’s house, and then into the garage!! Cats can be so funny sometimes. Tomorrow is Black Friday Sales Day, so we are planning to have black cat week! Planning to buy any new cat toys for your cats this special sales day? I’m sure they’ll be on sale!! So anyway… Just wanted to update everyone on how our Felines are and how everything’s doing. i am so sorry i haven’t written that much but we’ve been SO BUSY! Hope that your Thanks Giving was wonderful. And I hope that your felines enjoyed it too… just like mine did! I’ll write more soon! Happy Thanks Giving! This week, I am traveling to Georgia!! Yay! What will make the trip even better is that I will be acompanied by my five felines when we go!! I always enjoy bringing my cats on vacation! It is more fun, and you never start to miss your felines during the trip if you have them with you rather than leaving them at home! It is also less expensive to travel with your felines. You do not have to pay to have them stay home with a pet sitter, or pay to board them at a kitty hotel. You can just travel with them. I enjoy having my felines with me wherever I go. To have the best experience traveling with my PURRFRECT kitties, I always place their carriers in a place where they can see and hear me in the car. This is a good idea, because it keeps your kitties from getting afraid or not knowing where you are. Felines tend to feel more comfortable when you are present. I always am always sure to use good cat carriers. If your felines have hard carriers, it is a good idea to put a soft towel at the bottom of the carrier so your kitty feels comfortable. present to your kitty when you arrive at your destination. I love to travel with felines! I hope that my tips and ideas help to make traveling with pets as easy as can be! Thanks for reading! Hi! Sorry I haven’t been writing lot lately! We have been busy! I wanted to write a post today about how important cat photography is to me. I think cat photography is better than any other kind. Something about those beautiful close-ups of a cat’s face– and those gorgeous photos of a cats rollings around happily in a flower bed, or a kitten hiding in a bucket– oh, they’re so pretty! Felines are beautiful. I love to snap photos of them. Every time you see your cat doing something special– or you just have got to take a pic of your kitten’s amazing face– just pull out your camera! Sometimes, your cat may pull a stunt that you may never be able to witness again, so it is always a good idea to snap a picture of your cat, even he/she is just doing something simple. Sometimes, when photographing your favorite feline, or really any animal, you might find it hard to get it to look over at the camera, or it might walk out of the scene, if you know what I mean. Here are some tips to help you get the purrfect pic! 1. To get your cat to look at the camera, you can try making quite noises that may attract the cat to look at the camera. May be tap your kitty on the head so she will look over. 2. To find the perfect seen, sometimes you have to wait untill your cat finds one. When you see your cat in an amazing view, than go ahead, pull out your camera, snap a picture! Find cute, cool places to set your cat on to make an awesome picture with a cool back ground seen. 3. When you don’t think you can take a good photo of your cat, just remember my advice: it doesn’t have to be anything amazing, or anything too fascinating! Just start by taking pictures of your feline, and see what you think is cool! Thanks for reading! check back for more posts soon! hope that you can take some good feline photos– with my advice and tips! Maybe i can post some cat photography soon! One of my cats, Pearl, has worms. We took her to the vet and they said she had tape worms. I am so worried! But, the vet gave her a shot that should de-worm her. We also found at from the vet that Pearl has a problem with her teeth (Can’t remember what it’s called! The vet looked at her teeth and showed us how they were slightly red at the top and bottom. They suggested that we give her Oral Hygiene Chews for Cats. They are little things that will help with her teeth/gum problem. The worms were ew- so gross! I’ll write more posts soon! Thanks for reading! Keep checking back! 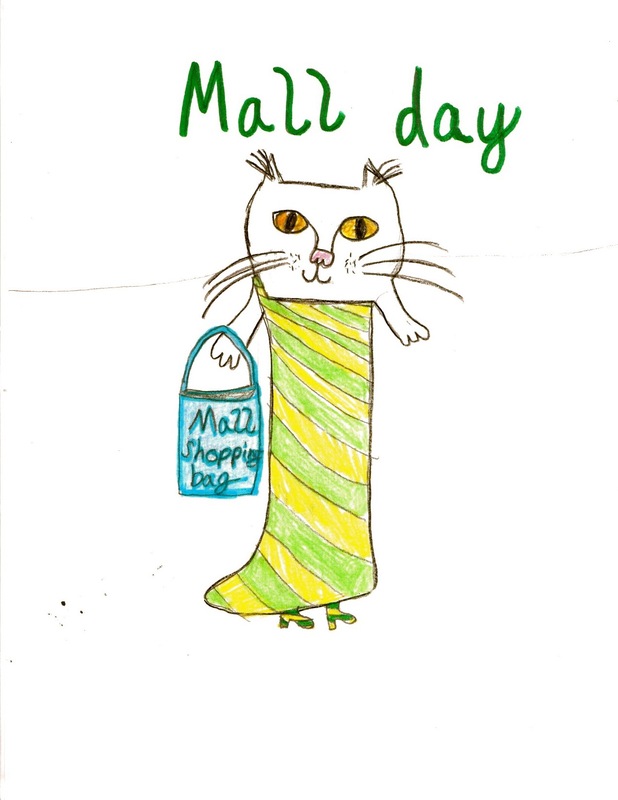 Winning Entries for Kitties in Clothes Contest!!! 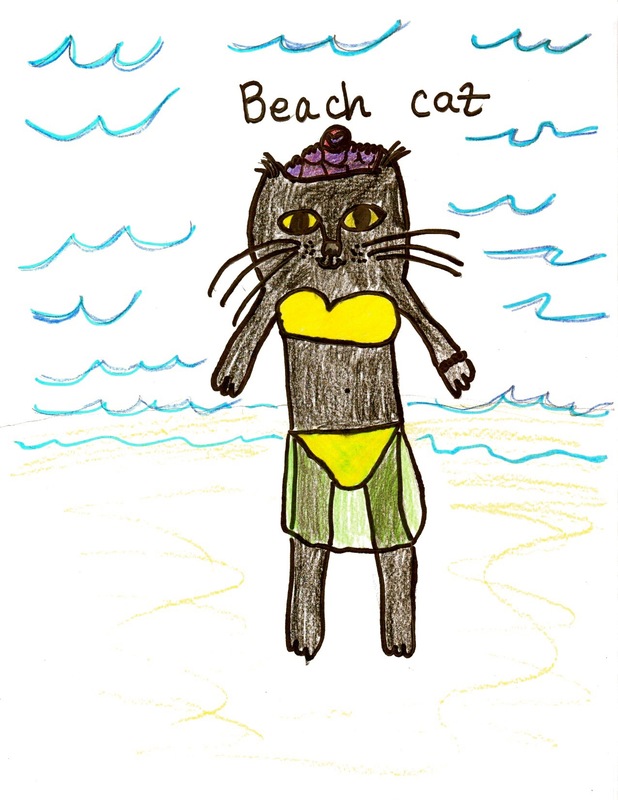 WE ARE SO GRATEFUL FOR ALL OF OUR GREAT ENTRIES IN THE KITTIES IN CLOTHES CONTEST!!! 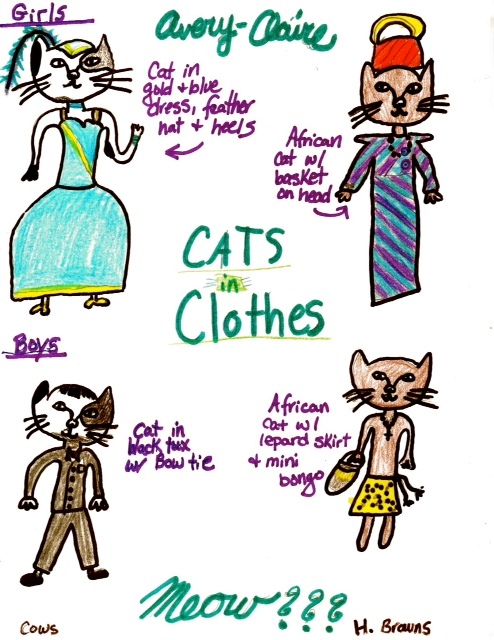 Here is AC’s Kitties in Clothes Contest entry!! I love the detail and especially the out fits! Both of the entries tied for first place!! I love the beautiful, blue dress that the cat on the top right is wearing. So adorable! We love your entry, AC! This is Patty’s Kitties in Clothes Contest entry! 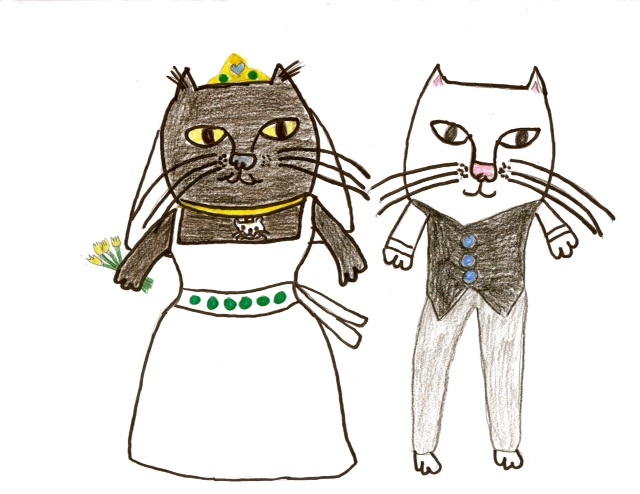 My favorite one of her Kitties in Clothes Picture is the Wedding Cats picture. So cute! 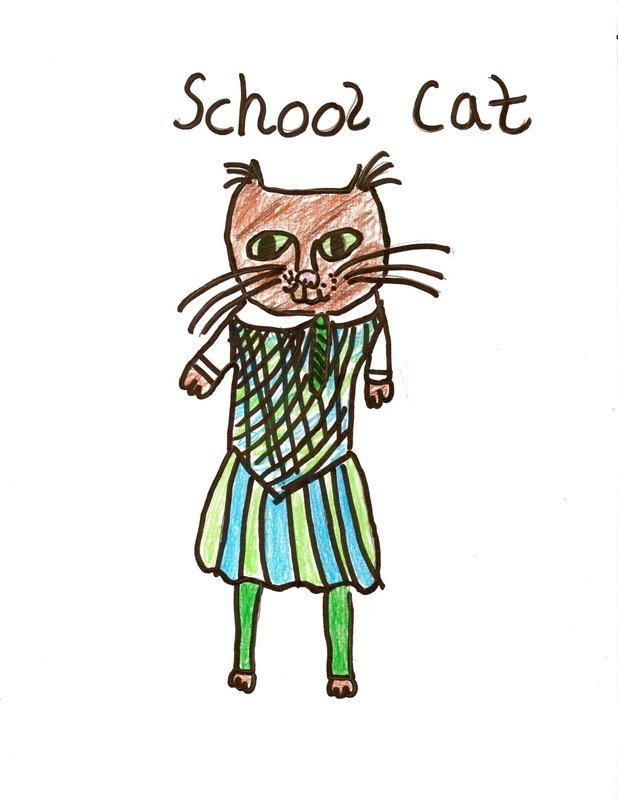 The one below that one shows a cat in a school uniform, the third one of her winning pictures shows a cat on a mall shopping day, and the fourth one of her winning pictures shows an adorable cat in a beach out fit!! Love your entries, Patty! Thanks for reading, everyone!! Check back for more posts soon! Loved all the entries!